Trying new salads is great in the summertime when it's just too hot to cook anything in the oven. 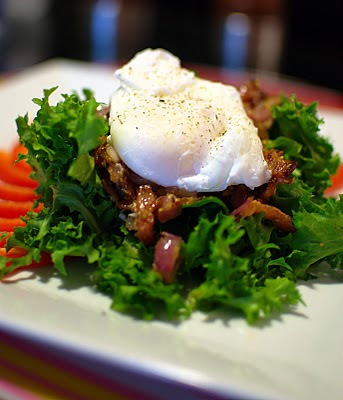 This was the first time we made a Lyonnaise salad. We recently made Nicoise salad and this is a lighter version. We chopped up and cooked bacon and onions in a bit of olive oil and Dijon mustard on low heat for about 20 minutes. We topped the bed of escarole with the mixture bacon and onions and then added a poached egg. Again, this is a healthy option for a salad, as long as you don't add too much bacon. There are about 100 calories per bacon slice, unfortunately.